Have you ever wondered where Yu-Gi-Oh comes to life? Why, it all happens in Kazuki Takahashi’s studio, that’s where. Let’s have a look inside! As 2ch recently pointed out, in the Jump-Ryu! Volume 8 video from a while back, we got a look at where Takahashi creates. Jump-Ryu takes viewers into the studios of famous manga artists, like Eiichiro Oda, shedding light on how these artists work and think. Upon arriving, the camera is greeted by Takahashi’s dog, which will remind Yu-Gi-Oh players of the Shiba Warrior Taro card. This room houses various Yu-Gi-Oh merchandise. and mementos. There is a game room with a pool table. Takahashi says he doesn’t much play pool, but staff do. The light fixture above it. Under a nearby staircase are collectibles from Star Wars, Alien, Terminator, and more. Takahashi said he began collecting these about ten year ago, and likes the Alien design in particular. This is the in-house bar, where he and staff get together for drinks. The studio has a movie theater, too. Takahashi says he’s never counted to see how many movies he has, but guesses the number is around 5,000. I always like looking at people’s book shelves. 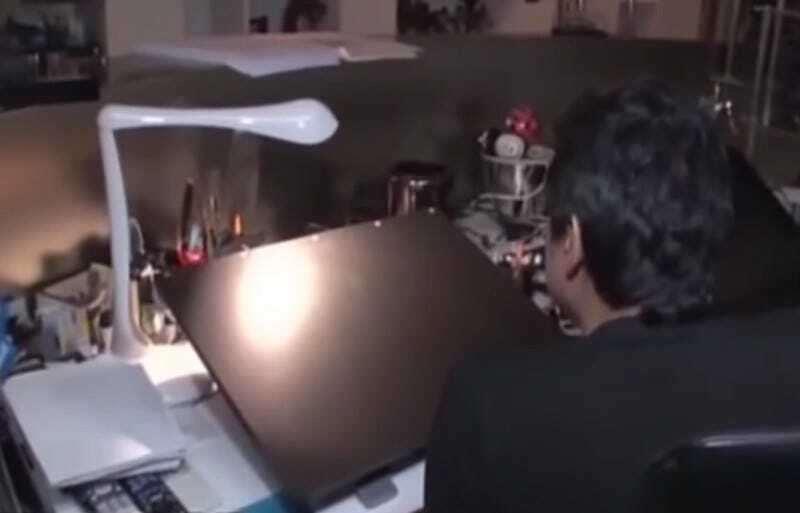 Here is Takahashi’s work space. Right behind his desk is a Millennium Falcon. He now has a tablet. But Takahashi’s work still starts on white paper with a mechanical pencil. For more on Shonen Jump, check out its official English site, and for more on Yu-Gi-Oh, you can see the worldwide card game site here and the series’ official site right here.